Jharkhand High Court Notification is out. Jharkhand High Court is recruiting for 73 Various Post Posts. 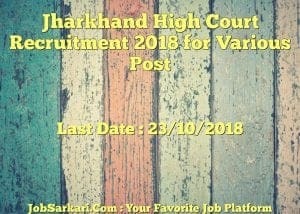 You can check Jharkhand High Court - Jharkhand High Court last date, download Jharkhand High Court notification, visit Jharkhand High Court official website and check other Jharkhand High Court Vacancy details.Complete Vacancy and recruitment Details about 73 Various Post vacancies in Jharkhand High Court are provided below by JobSarkari.Com only for you. Last date for Apply Online 23/10/2018. Assistant Candidate Must Have Passed Graduation With Knowledge of Working and Typing in Computer. 64. Librarian Candidate Must Have Passed Graduation in Library Science. 01. Cashier Candidate Must Have Passed Graduation in Commerce / Economics. 01. Translator Candidate Must Have Passed Graduation. 01. Jr. Translator Candidate Must Have Passed Graduation. 01. Typist Candidate Must Have Passed Graduation With Typing Speed of 40 W.pm. in English. 05. Total No of Post 73. Maximum Age for B.C. I / II / Female 38 Years. 6.Online Application Can be Submitted on or Before 23rd October 2018. Q. What is the Last Date For Jharkhand High Court Various Post Vacancy ? A. Last Date for Jharkhand High Court Various Post Posts is 23/10/2018. Q. What is the Form Type of Jharkhand High Court Various Post Recruitment ? A. The Form Type for Jharkhand High Court Various Post Posts is Online. Q. 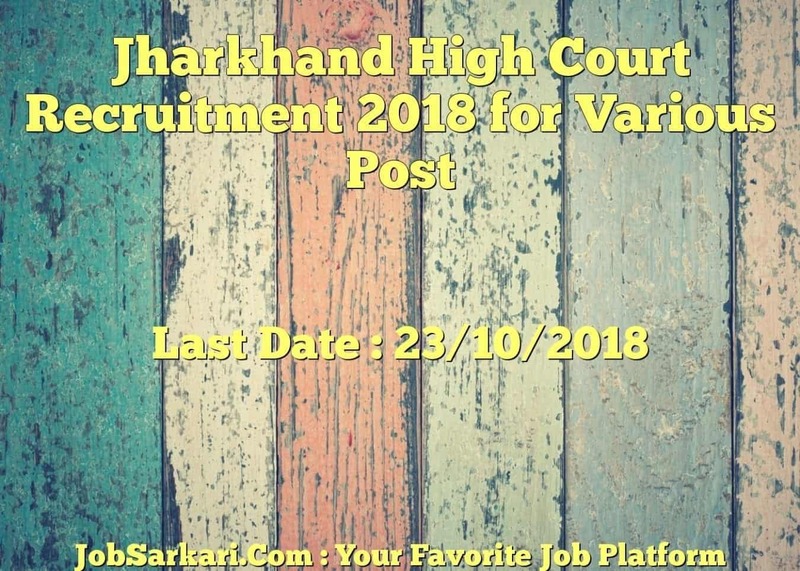 How many vacancies are available in Jharkhand High Court Various Post Posts ? A. There are about 70 Vacancies in Jharkhand High Court Various Post Posts. Q. What is the Full Form of Jharkhand High Court ? A. Full Form of Jharkhand High Court is Jharkhand High Court .